Now, more than ever, with further globalisation by internet and online platforms (video on-demand, eBooks and so on) comes increased power of translating media. You can now reach bigger audiences, making diving in and out of these countries easy, but you do have to cater to their language which requires translation services. That does not mean you cannot get into main bookstores and cinemas. Foreign box-office is where it’s at, usually being the majority of gross for Hollywood films. It simply means there’s another ‘market-within-the-market’ through VOD (video on-demand) and other electronic marketplaces. Even translating music can be beneficial as proven by ‘99 Red Balloons’ and the ‘Ketchup Song’. Below is largely based on estimations from websites like Box Office Mojo, IMDb and other media statistic outlets. It is to show the potential of translating your literature/media for other marketplaces. With VOD and eBooks, figures are scarce as companies like Netflix like to keep them under wraps . We shall soon see if it changes and becomes bragging material like the Box Office has become in the next few years. Studios often use the box office as a measure of success, barometer of quality, guide for future investment. It would be interesting to see if online sales and VOD becomes a similar guiding measurement. Let’s start with literature. Literature remains important after its believed inception in the 4th millennium BC. Then again, how could it not? It’s one of humanity’s defining characteristics. We identify with it, define ourselves by it, believe in its importance and still engage with it… but not like we used to. The industry is changing due to our increasing reliance on technology – the internet specifically. Computers now have ample amounts of storage. No longer is a lack of storage an issue for anyone – you can buy cheap memory sticks with enough to house 10,000 songs like it is nothing. With population increasing and homes becoming more compact, we lack space to adorn and decorate our rooms with books on shelves. Further than that, we are starting to realise the logistical issue surrounding moving large quantities of books. As anyone who has moved will testify: books bundled into a box are bad for your back! By owning any smart device, you now have access to a vast quantity of literature – professional and amateur – in the palm of your hand. If you can bear the small screen or own one of the larger ones, you can read an entire novel on your phone. You can read thousands, in fact. There is dedicated technology, of course, eReaders have smart screens to replicate books that are still readable even in bright sunlight. The screens larger and try to replicate a paper novel as much as possible, despite its light weight. Oh and the fact it can house more books than you can fit in a cul-de-sac. eBooks are simply text which means that an entire novel will take up a relatively small amount of space. Novels vary in file size, but the average is between 300kb and 1mb – the latter being a generous estimation. That means, if we take the average file size as 650kb, you could potentially store 6301 books into 4gb. This accessibility – which has always been apparent with the amount of shops selling literature – has now been amplified even further and readers can feel more in control of their own choices. With social media dedicated to literature, like GoodReads and Letterboxd (for films), the audience recommendations are a considerable driving force of the market. But so what? What does this have to do with the power of translating literature? Instead of publishing, printing and transporting several thousand books, you can lower your overheads massively and publish on outlets like Amazon for their Kindles etc. You can know send it in to a company for them to publish it electronically and watch how it does. Even Marvel comics are now moving into the Kindle store. But enough of the potential or the technical specs surrounding eBooks, how much is it actually worth being able to store all those books? Can anyone read that many? What is the value? In 2010, e-book revenue in North America alone amounted to 1.2 billion U.S. dollars. That would be considered the product’s infancy too. As the popularity of eReaders grow, the amount of money generated in the electronic industry grows even further. There is a market. A big one. 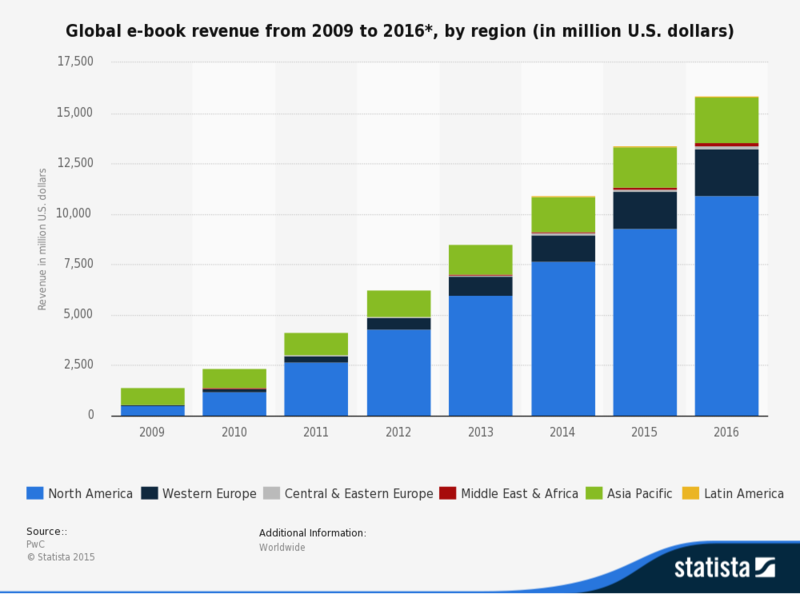 Professional analysts Statista have forecasted that by 2016, the global eBook sales will be worth $15.87bn. Sales of printed literature continues to fall as readers migrate to the electronic counterpart – probably for the reasons listed above – but is a market which still has value; eBooks’ low overheads is what makes it more a market to watch or emerge in if you are new. If you are established in this industry, then you will be aware of printed literature’s costs and how, despite the dips, there is still a market lifeline. To move into how this relates to translation, the numbers are interesting. Recently, James Joyce’s experimental classic Finnegans Wake became a bestseller in China after being translated into the local language. If a book that relies heavily on Joyce’s mastery of prose can become a best seller through a successful translation, there is definitely a market for literature to move into. Foreign literature sales have boomed in the UK, but only when translated into English. As a commenter in the section of The Guardian points out, publishers must ‘wake up … to the value of a good translator’. That is the customer directly saying the importance of a well-translated piece being the focus of his purchase. There is an audience that wants to experience another culture through their views on life, love and everything through the format of prose. Rough translations loses readers and has a negative effect on your image. This month, in fact, Nick Barley (Edinburgh book festival director) counters by claiming British reading habits are ‘an embarrassment’ due to only 5% of all books printed in the UK were first published in another language. Barley believes it is the responsibility of festivals like his to ‘make available literature in translation’ to provide the audience with a bigger variety and some fantastic literature that might not make it across otherwise. The resurgence that Barley is calling for is to realise the power of foreign literature. Without it, readers would not be aware of classics by people like Fyodor Dostoyevsky – to name a stone-cold influencer. Foreign literature sales are increasing, but the selection in the UK is not there. Other markets are beginning to open themselves up to other literature – the amount of foreign literature making it across language barriers is unreal. Here, the Guardian, the New Yorker and Publishing Perspectives summarise the lack of translated literature is due to shy publishing houses. There is potential in it as seen by other countries – ‘the 45 per cent of books released in the Netherlands, for example, 70 per cent in Slovenia and one-third of the literary output in France.’ Who will be the first capitalise in the UK and in America too? Sadly, there are no concrete nor definitive figures regarding the sales of physical copies of books. The statistics are always in contention with Nielsen BookScan considered the main authority on sales figures. Even then, though, Nielsen admit that their figures are only representative of roughly 75% of all sales, meaning they are far from accurate yet are, weirdly, the most accurate figures available. Regardless, the speculative figures – no matter how accurate – still demonstrate a great potential market with the right investors, marketing and translation. Swedish noirs, for example, have become predominant since the translation of the Millennium series after Steig Larsson’s unfortunate passing. Now, the trilogy has sold more than 80m copies with a fourth being written from the notes that Larsson left. If we go for the extreme example, the Harry Potter series is the highest selling of all time, selling 450m copies which roughly equates to 1/16th of the world owning a Harry Potter book. As it stands, Harry Potter has been translated into 74 languages including Welsh, which could possibly explain its overwhelming amount of sales. It has catered to many different cultures and, therefore, sold successfully to more demographics to maximise its reach. By population alone, if you narrow yourselves to the English speaking North American market then you focus on roughly 357m people, rather than the estimated 7.2bn people worldwide. That is shrinking your market potential to only 4.96%. As an English speaking civilisation, we are missing out on some cultural classics. There are plenty – FlavorWire listed 50 must-reads with room to extend. Our culture would not be as powerful if it wasn’t for Nietzsche, Kant, Camus, Kafka and so many more. That is not to say it should be one way traffic. Although in the US and UK, we do suffer from the least amount of translated literature, our classics – our Dickens, Eliots, Fitzgeralds, Joyces – deserve even more of an audience. As pointed out above, if you only target the English speaking markets, you are reducing your slice of cake to a slither. Why do that? Utilise translation services to have your cake and eat it too. Films and TV are as lucrative. Take a look at the other part of this ultimate guide on translating media on VoiceBox. Have look at our translation services to find out how we can work with you to improve your sales.